NOTICE: This version of DoubleTreeJS requires version 3 of d3 and does NOT work with version 4. An update is in progress. This re-implementation of DoubleTree includes several of the enhancements mentioned in Culy and Lyding, 2010, including the abilities to sort the branches by a variety of properties, to filter the branches by different properties, and to search the words in the DoubleTree. It also is designed to work with various types of structured data. See also my KWICis concordance viewer, also designed for structured data. DoubleTreeJS Comparison Shows two DoubleTrees sided by side, for comparison of different words. Selecting a word in one shows it centered in the other. DoubleTreeJS Document Comparison Shows two DoubleTrees sided by side, for comparison of different words from separate documents. Selecting a word in one shows it centered in the other. DoubleTreeJS + Metadata Shows coloring of nodes according to metadata. Also shows the use of lemmas rather than tokens as the nodes. Clustering with KWICis and DoubleTreeJS Shows multiple DoubleTreeJS on a single page, as well as integration with KWICis. Not included in this download, just in the KWICis download. Two additional examples are included in the download. One is the system from Culy et al. 2014. 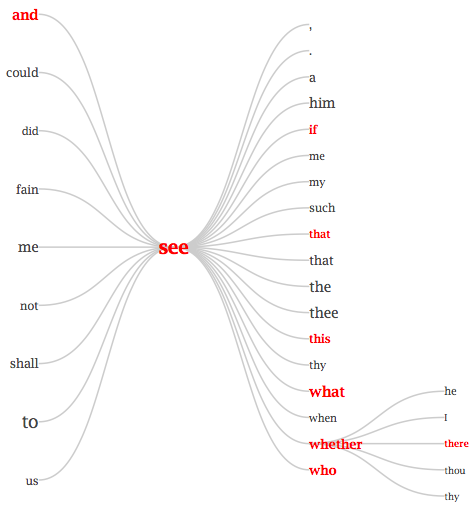 The other shows how to use DoubleTreeJS to visualize results from a corpus query engine. Hint: in all of the examples, you can use text files which have the part of speech (POS) immediately following word, separated by a slash: espresso/NN. There is nothing special about POS information: you can put any information after the slash and the filtering and sorting will (should) work with that information. DoubleTreeJS is still very much under development, and this is not a final release. Any feedback is appreciated. Many of the samples should be usable as is. The data format is extremely simple: your input file should have one item per line, with the word first, and optionally followed by a "/" and then a part of speech. e.g. For more advanced users, there is a developer's guide, as well as jsdoc API documentation. In addition, there is an example of how to use DoubleTreeJS with SketchEngine. This example is intended for those who have their own instance of SketchEngine, or some other corpus query engine. DoubleTreeJS has been tested with Chrome, Firefox, Opera, and Safari on OS X 10.6 and 10.8, as well as Chrome and Firefox on Windows 7. Older versions of Safari my not allow local files to be read, in which case you will not be able to try your own data. In Firefox on Linux, instead of alt-click, use AltGr+Alt-click (Firefox uses alt-click for itself). DoubleTreeJS does not function at all in IE (at least not version 9 or lower). C. Culy, M. Passarotti, and U. König-Cardanobile. 2014. A Compact Interactive Visualization of Dependency Treebank Query Results. in Proceedings of the Ninth International Conference on Language Resources and Evaluation (LREC'14), Rejkjavik, Iceland. May 26-31, 2014. N. Calzolari et al. (eds.). ELRA. Culy, C. and V. Lyding. 2010. "Double Tree: An Advanced KWIC Visualization for Expert Users" in Information Visualization, Proceedings of IV 2010, 2010 14th International Conference Information Visualization, 98-103. Please let me know if you have other suggestions, or suggestions for a priority order. DoubleTreeJS uses the D3 toolkit, and the tree drawing uses elements from its examples. Some of the examples use the canvg library for drawing SVG to HTML canvas. Thanks to Corina Dima, Ulla Köning-Cardanobile, Verena Lyding, L. Lee McIntyre, Marco Passarotti, Eran Raveh and Tanja Säily for useful feedback and testing. Loading a new file in doubletree-compare.html and in doubletree-compare-docs.html now resets the tree correctly. Pressing enter in a "Word to use" field now selects the first word in the prediction list.